Once in Manila, get a consequent amount of cash in case you can’t withdraw money during your trip. There is no ATM in Coron and Banaue. Download maps.me on your phone and get all Philippines maps before leaving. It works without any connection and has all roads even walking paths. The following 18-day itinerary’s budget is 700$ without including the flight from your home country to Manila. Don’t forget that this is an itinerary made for backpackers by backpackers. In Philippines, if you live like local people or at least try to eat at the market and use public transportation, you can spend less than 40$ per day. Always bargain and try to join group of people to share expenses. Once you arrive at Manila airport, take a taxi to Ohayami Trans bus terminal for 400php (8$). Take a night bus to Banaue for 490php (10$). Daily departures at 9pm; 9:30pm; 10pm. Journey is around 8 hours. 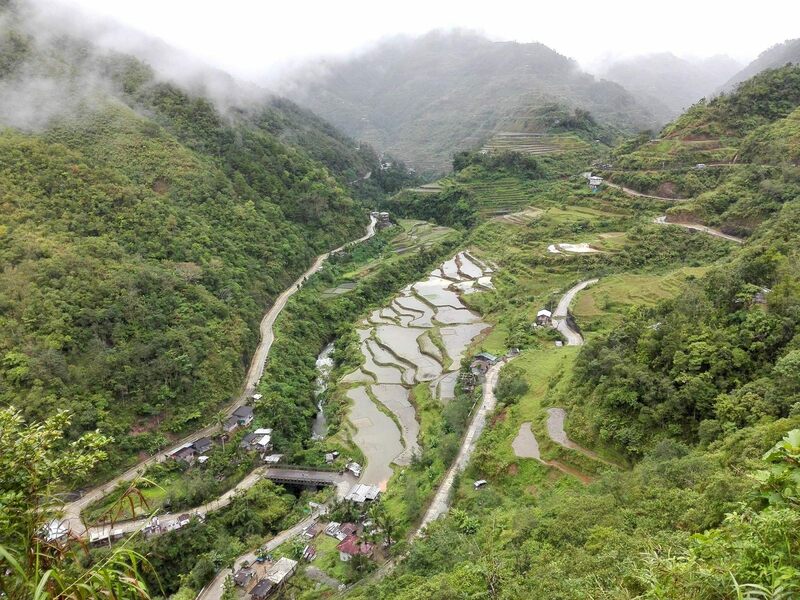 Banaue is known for its rice terraces often called “the 8th Wonder of the World”. 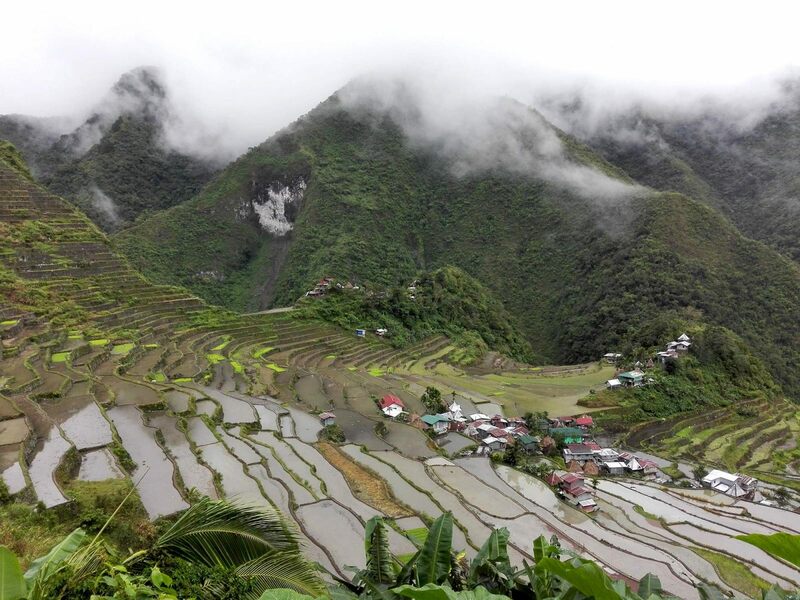 As part of the Ifugao province, Banaue is the starting point of many treks. You will arrive soon in the morning at Banaue so it will leave you time to organize your trip. You can decide to book a trekking with an agency or do it by yourself. 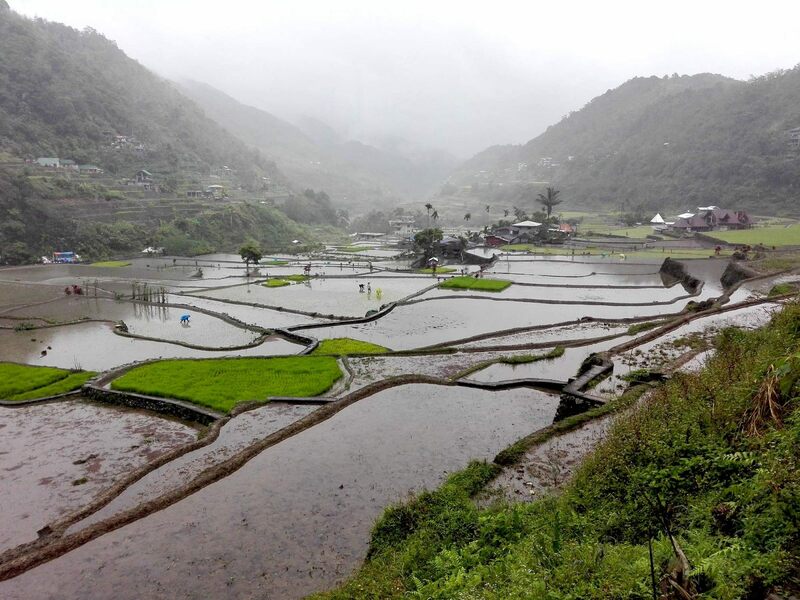 Banaue – On maps.me , mark all the “Banaue rice terraces viewpoints” and follow them on the main road until you reach the last one “Banaue Main Viewpoint”. 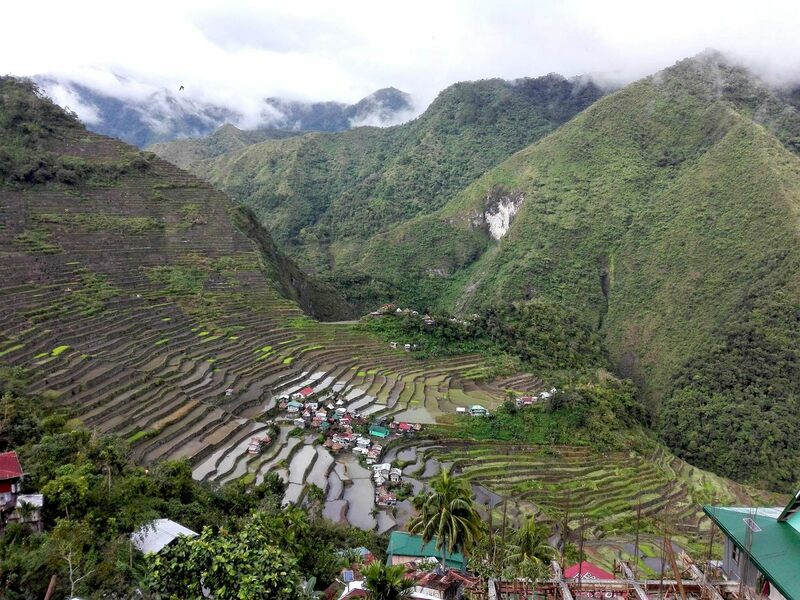 From there, you can go back to Banaue through the rice terraces. This challenging trekking takes around 5 hours so try to leave in the morning if you want to take your time. Hungduan and Hapao – Take a tricycle and bargain to get the cheapest price which might be 400php (8$) and ask the driver to wait for you. It takes 30 minutes. Once there just enjoy the different viewpoints and walk through the rice terraces. Behind the rice terraces, there is a hot spring where you can swim but you need to pay a guide to go there, they will not let you go without him. Batad – Take a tricycle for 600php (12$) with the return. Leave in the morning and come back in the afternoon. Once at the saddle, you have to walk 45 minutes to reach the rice terraces. Then, you can enjoy the different viewpoints and walk to Tappia Falls which takes 2h with the return. People’s Lodge and Restaurant is well situated in Banaue and a nice staff that will help you to book anything you want, from tricycle to trekking, and bus. Cheapest room is 400php (8$) with a two single beds and cold water in a shared bathroom. You can use free Wi-Fi at the restaurant. There is a small market next to the gym, you can find a kitchen where you can have a proper hot meal with rice and pork or chicken, and vegetables for 30php (0.60$). Just ask the lady what she has and she will serve you in 2 minutes. From Banaue, take a Ohayami Trans bus to reach Manila for 490php (10$). Daily departures at 6:30pm and 7pm from the junction on the main road. Journey is around 8 hours. From Manila airport, you can fly with Philippines Airlines, Cebgo or Skyjet to Francisco B. Reyes, Busuanga airport. Skyjet usually are the cheapest flights and cost between 60$ and 80$ (one-way). Try to book a late afternoon flight to keep enough time reaching Manila airport from the central bus station. Once you arrive at the airport in Busuanga, you can take a van for 150php (3$) to reach Coron. Located in the north of Palawan, Coron is the best definition of paradise. Forbes has listed the island as one of the top-10 best scuba diving sites in the world. 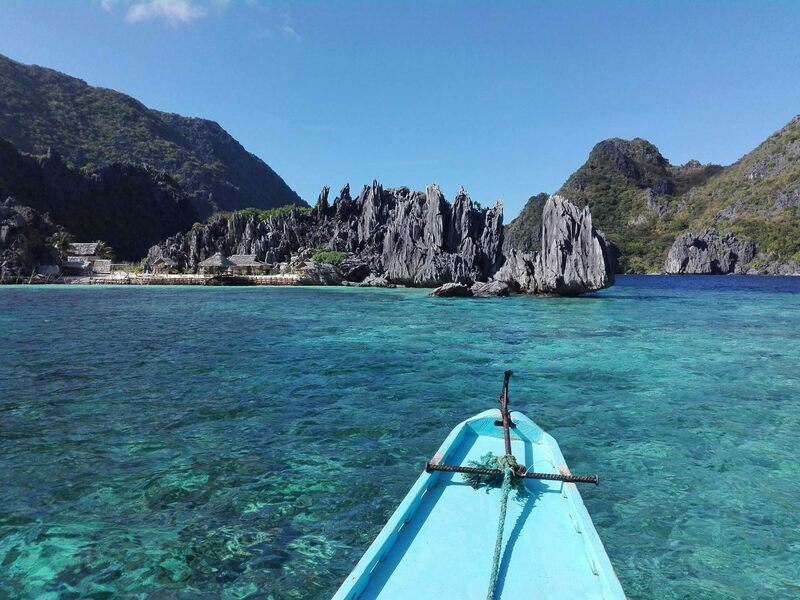 Large rock formations surrounding Coron provide excellent snorkeling opportunities, with a great underwater visibility. You can also enjoy diving around the several Japanese shipwrecks that have sunken during the WWII. If you are at least two people, the best thing to do is to book a private boat with a guide, arranging yourself for lunch, choosing what you want to see and asking for a different schedule than tours so that you won’t find many tourists on each location. Must-see ♡: Kayangan Lake, Twin Lagoon, Siete Picados, Skeleton Wreck, Dimanglet Island, Beach 91, Barracuda Lake, Malcapuya Island, and Bulog Dos Islands. Patrik & Tezz Guesthouse is a traditional Filipino house made of bamboo walls. Close to the main street, this guesthouse will make you feel like home. You have fan in rooms, free hot shower, free Wi-Fi which is rare on the island, a small pool and a rooftop to watch beautiful sunsets. Everything is perfectly clean and staff sooooo lovely as well as the dog. They can arrange tours for you and if you need anything just ask. The guesthouse only has 6 rooms so you need to book in advance. Price for a double-bed room is 550php/night (11$). Coron doesn’t have a lot of restaurants but you can go to small kitchen for local food like rice, eggs and vegetables. This is the cheapest option. Also, you can buy fresh fish at the market if you go early in the morning. This is where all agencies buy their food for lunch on tours. 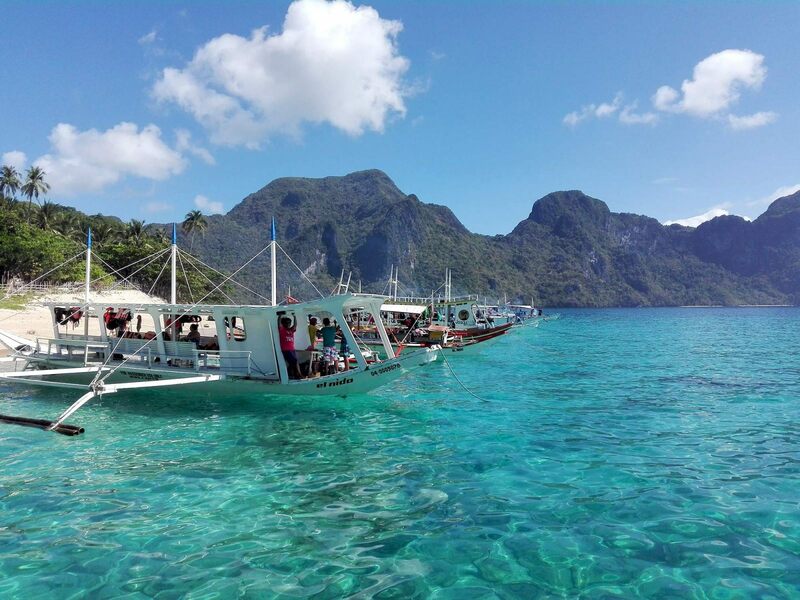 The only way to reach El Nido is by boat with the company Montenegro Lines. It takes almost 4 hours and costs 1760php (35$). Departure from the pier, every day at 12 noon. El Nido is the starting point to discover Bacuit archipelago – said to be one of the most beautiful bays in the world. With its limestone cliffs, white sand beaches and wonderful coral reefs, the Bacuit archipelago will leave you speechless. Island hopping is the most famous activity in El Nido. As for Coron, every agency offers the same package with prices around 1200php (24$) with lunch included. 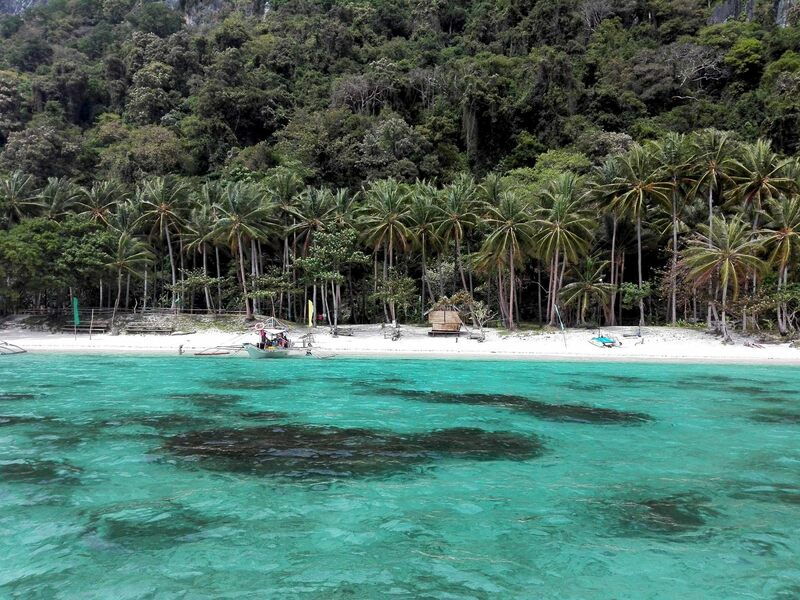 El Nido is very touristy so don’t expect to be alone on the beach. Especially on Tour A and Tour C which are the most popular. Anyway, don’t miss them! Must-see ♡: Small Lagoon, Big Lagoon, Secret Beach, Talisay Island, and Star Beach. If you want to take a break between two island hopping tours, you can rent a motorbike for 250php (5$) to explore the surroundings. Driving in the direction of Nacpan Beach will make you discovering the countryside of the region with its beautiful green rice fields, buffalos, children running everywhere and small villages. Nacpan is an endless white-sand beach with coconut trees all around and some waves to play in. From there, you can walk to its twin sister, Calitang Beach. If you want to stay close to the center, then I definitely recommend you Hakuna Matata Hostel . It has dorms with 6 beds for 300php (6$) and twin private rooms for 800php (16$). The place is small and very basic but it might be the cheapest option in town. If you want to stay in a more peaceful place, then reach Corong Corong, which is a small fishermen village only 2km from El Nido. There you can find little bamboo hut for 250php (5$) facing the beach. El Nido has more occidental type of restaurants than local food and usually they are expensive. So if you are on a budget, you can go to Silog Republic , they have noodles, chicken, and popular silog which known to be the easiest meal to prepare – fried rice, egg, and chicken, pork or fish - Filipinos eat it for breakfast. The cheapest option to go from El Nido to Bohol is flying to Cebu then taking a boat to Tagbilaran. - One-way flight is 1h40 and costs around 95$ with AirSwift. There is only one flight per day and it leaves in the afternoon. When you arrive at Cebu airport, take a taxi to the pier for 200php (4$) – 30min drive. 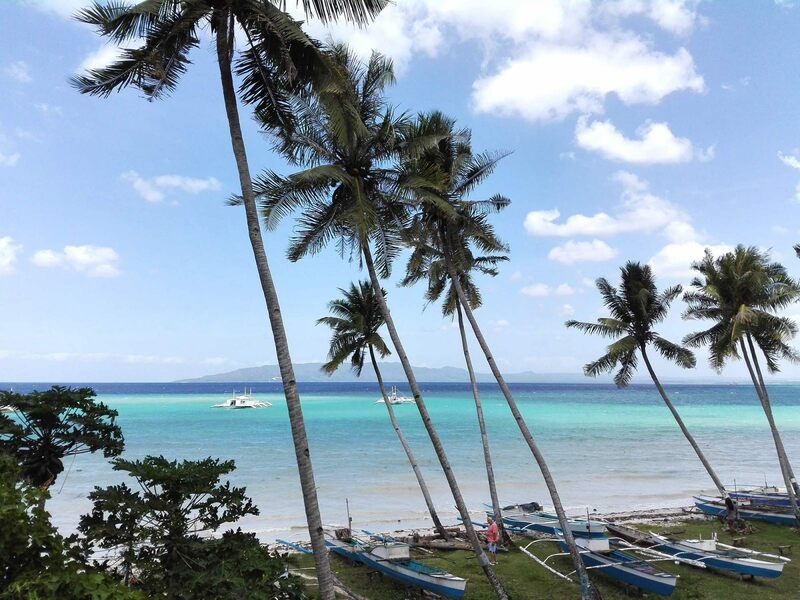 - At the pier, you can book a ferry to Tagbilaran with Oceanjet for 800php (16$). Daily departures every hour in the morning and every two hours in the afternoon. It takes 2 hours. - From Tagbilaran pier, take a tricycle for 150php (3$) – 30min drive. 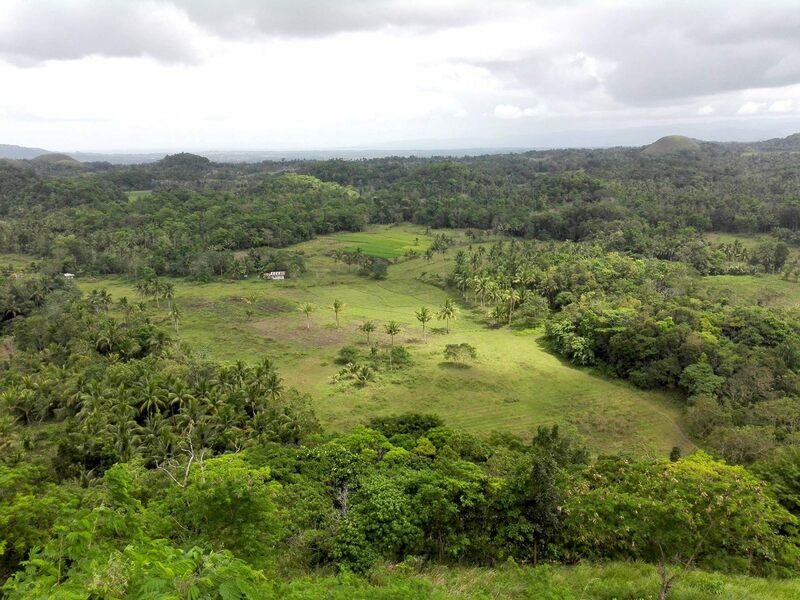 Bohol is located in the Visayas region and is often referred to as the Jewel of the Philippines. Famous for its Chocolate Hills, a geographical formation of more than 1000 hills spread over an area of more than 50 square kilometers. They are covered in green grass that turns brown like chocolate during the dry season, hence the name. But Bohol also has great beaches and coral reefs to explore especially along Panglao Island which is at the South of Bohol. Chocolate Hills – You can book a tour with an agency but I recommend you to go by yourself with a renting motorbike for 250php (5$). 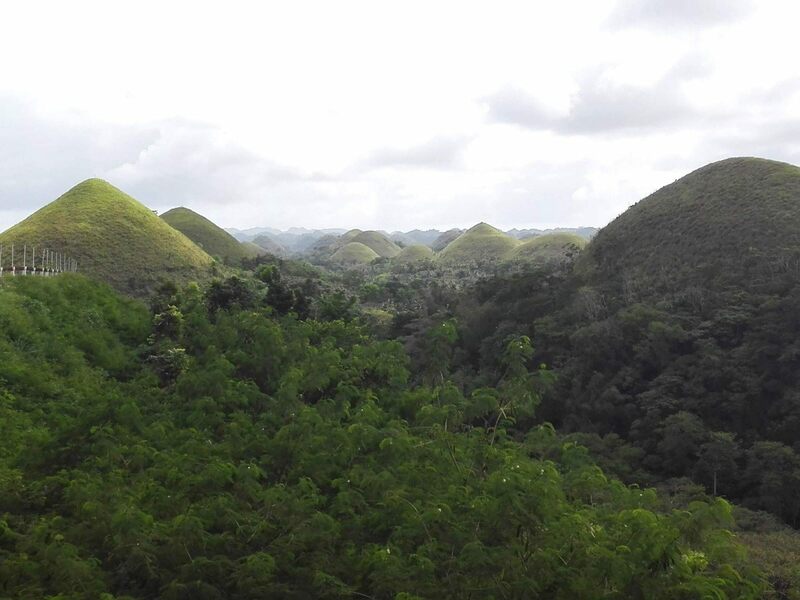 Entrance fee of the Chocolate Hills is 50php (1$). On your way, you can make a stop at the Tarsier Sanctuary to observe the smallest animal on earth. Entrance fee is 60php (1$). 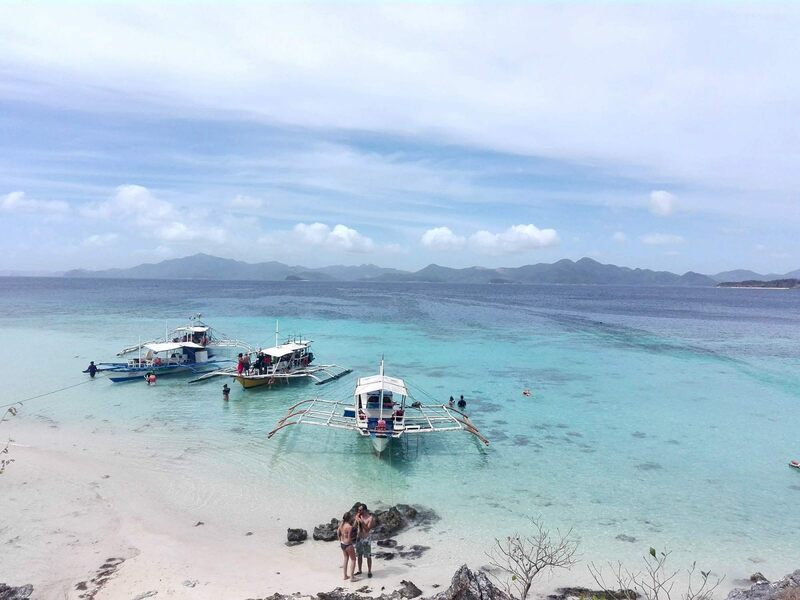 Island Hopping – Balicasag & Virgin Island are two beautiful snorkeling and swimming spots. You can watch turtles in Balicasag as well as exotic species of fish. Virgin Island has a nice bunch of starfishes. Tours usually cost 700php (14$). 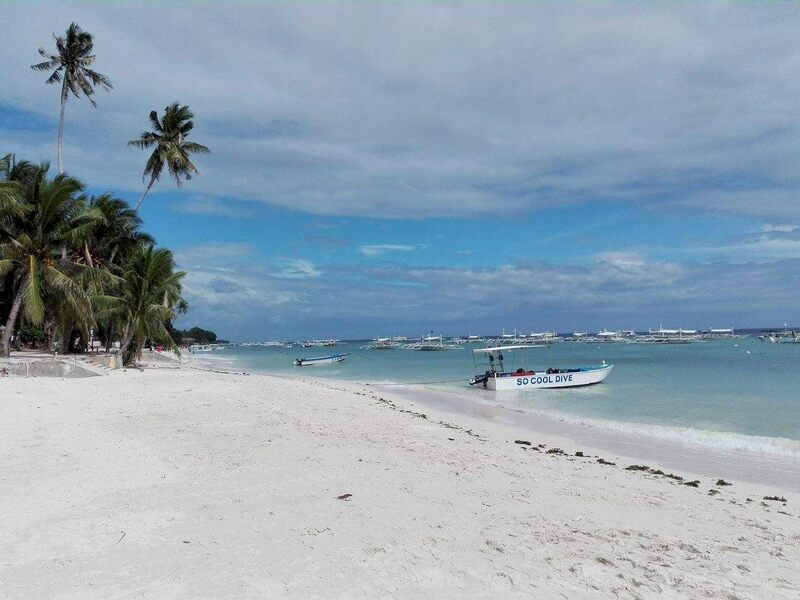 Alona Beach – It’s the famous beach where every tourist go, this is where you will find most of the accomodations, restaurants and tour agencies. Even though it can be crowded, it’s a nice place to relax, and at night you can enjoy cheap massages on the beach. Hinagdanan Cave and Panglao Beach – If you are at least 2 people then share a tricycle for 300php (6$). Hinagdanan Cave is a small grotto with rock formations and a beautiful lagoon where you can swim. It’s not really popular so you won’t find many tourists there. Entrance fee is 50php (1$). 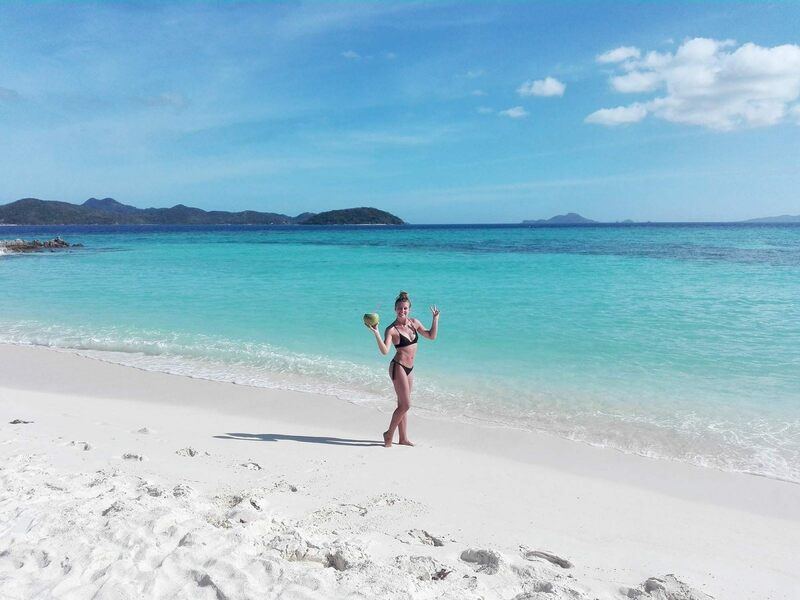 From there, you can walk to Natura Vista which is a resort next to the cave, following the path will bring you to a beautiful desert beach with coconut trees and turquoise water. Alona Beach has a lot of accommodations but I recommend you Casa Nova Garden which has very cheap prices for single room – 300php (6$) and double bedroom – 500php (10$). If you want A/C instead of fan, you can take a double bedroom for 800php (16$). Free Wi-Fi and swimming pool. If you want the best breakfast in town, then go to Gavroche French Bakery . The owner is French and tries to get the best ingredients to cook real French food…. Croissants, pains aux chocolat, apple pie, hot chocolate, éclair, millefeuilles…. And it’s delicious!!! If you want a cheap meal, Boy's Lechon Manok & Liempo is the right place. You don’t have a lot of choice, but very good grilled chicken breasts and legs. To go to the airport from Alona Beach, you can take a tricycle for 300php (6$) or a taxi for 600php (12$). There is a public jeepney leaving from the main road to city center for 50php (1$) but you have to ask for time schedule. From Tagbilaran, flights to Manila cost around 60$ and take 1h30. This is a short itinerary to see most-beautiful places in Philippines but you can adapt it with your time and budget.